Acromegaly is a chronic disease with an important impact on patients, Health Related Quality of Life (HRQoL). The ability to effectively measure Health Related Quality of Life is central to describing the impacts of disease or treatment upon the patient, therefore the importance of having a disease specific questionnaire for acromegaly. 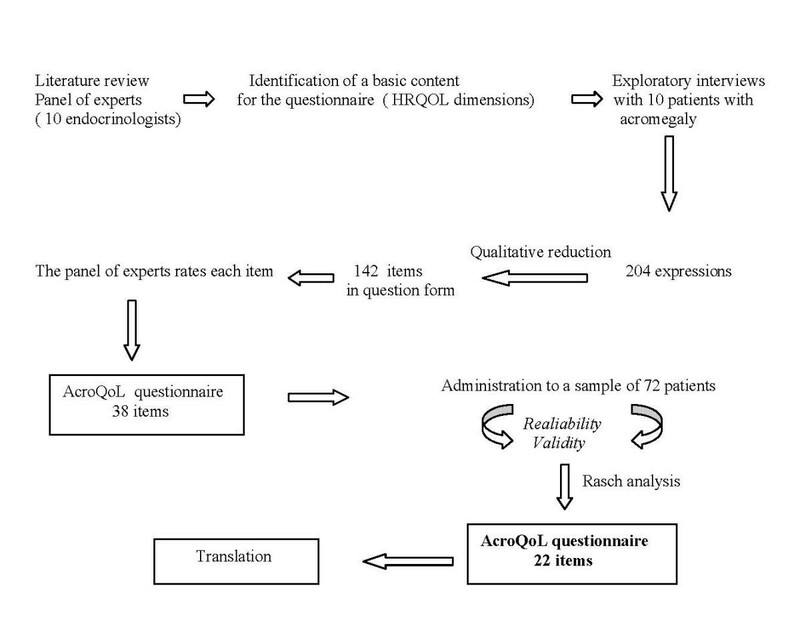 For the development of the AcroQoL questionnaire different sources of information were used: first a literature search was performed to identify relevant papers describing the impact of acromegaly in HRQoL, second the main domains of impact on HRQoL were identified by 10 experts endocrinologists, and third ten in-depth semi-structured interviews were conducted in acromegalic patients to identify domains and items related to the self-perceived impact of acromegaly in patients' life. After a proper qualitative analysis a preliminary 38 item questionnaire was obtained. Rasch analysis concluded with a final 22 item questionnaire. The measurement properties (validity and reliability) of the resulting final questionnaire were tested and compared using standard procedures (Cronbach's Alpha and item-total correlation). The evaluation of the item parameters confirmed the construct validity of the new instrument. Responsiveness to change was assessed in a small sample of 32 acromegalic patients with active disease in Spain who were administered the AcroQoL and the generic questionnaire EuroQoL 5-D. The results showed a statistically significant relationship between all the dimensions of AcroQoL and the VAS (visual analogic scale) of EQ-5D. An improvement in the global score of AcroQoL was related to a global improvement in the VAS of the EQ-5D. Following the current recommended standard methodology the Spanish questionnaire was translated into eleven other languages. Why assess Health Related Quality of Life in patients with Acromegaly? Any health problem may place significant restrictions on the normal development of physical, emotional and social aspects of a patient's life. The increasing interest in measures reflecting the personal viewpoint of patients' health has led to an extended demand for reliable and valid standardized questionnaires of Health-Related Quality of Life (HRQoL) . Although the use of HRQoL questionnaires is more common in clinical research, their use in clinical practice can also help clinicians to obtain standardized information on the impact of the disease and its treatment on patients' HRQOL; information that cannot be obtained using traditional measures, and that could be of a great use in clinical decision making. Taking into account features like item content, scope and target population, instruments can basically be classified as generic or disease-specific . Disease-specific questionnaires, those that only contain items specifically designed for a particular condition, are more likely to be relevant and sensitive to patients in areas that clinicians may wish to monitor. Acromegaly, excessive growing hormone (GH) secretion, is a rare affection with an annual incidence between 3 and 4 cases per million of people, being more common in women . Chronic effects of acromegaly are not only disabling but also disfiguring . Most acromegalic patients present with 4–10 years' history of changes in features, bony overgrowth, soft tissue swelling, tiredness, skin changes as well as cardiovascular symptoms [5, 6]. All these factors make acromegaly a disease with considerable impact on HRQOL. Furthermore, the correlation between clinical severity and impact of disease on patients' lives is weak; thus is important to include HRQOL as an outcome measure. Dimensions such as body image, pain, depression, mood lability, energy and strength level, as well as physical and mental drive, have been described as some of the most important personal domains affected in patients with acromegaly [7–10]. An instrument to assess HRQOL in people suffering acromegaly can be very helpful to provide clinicians with an effective means to assess patients' self-perceived status as well as to screen patients who require appropriate further evaluation. The Acromegaly Quality of Life Questionnaire (ACROQOL) is the first acromegaly-specific HRQOL measure designed for use in clinical trials and for the routine monitoring of patients diagnosed of acromegaly. How was the AcroQoL developed? The AcroQoL was originally developed in 2001 by X. Badia and colleagues . The strategy was to first carry out a literature search to identify relevant papers describing the impact of acromegaly in HRQOL [7–9, 12]. Dimensions which appeared to be important in acromegaly were: body image, depression, mood lability, pain, energy and strength level, as well as physical and mental domains. Secondly ten experienced endocrinologists were asked to enumerate and identify those domains of acromegaly they believed would cause problems in patients' life. The domains considered important in the assessment of the patient's perception of health in acromegaly were: physical, psychological, social, capacity to perform daily activities, symptoms, cognitive ability, health perception, sleeping abnormalities, sexual function, energy/vitality, pain and body image. This information allowed the identification of dimensions considered important in the assessment of the patients' perception of health. Afterwards, 10 in-depth semi-structured interviews of patients with acromegaly were obtained. The aim was to determine those aspects of the parameters that were most commonly cited by them as incapacitating in the achievement of their needs; they were specifically asked to describe the areas of their lives that were influenced by acromegaly with special emphasis on dimensions identified above. The interviews were conducted in an office by a physician, were tape-recorded, took between 30 and 60 minutes and were later transcribed. From these transcripts, a series of 204 items were obtained relevant to the various involved domains. After eliminating items considered ambiguous, complicated to read, double-barrelled, and also those with jargon terms, too long or negatively worded, a first item reduction resulted in 142 items drafted in question form. A qualitative reduction of these items was then performed. The criteria to include or exclude one of the 142 items analysed were based on the mean scoring given by the experts for the three scales: "clarity of wording", "frequency of occurrence", and "importance" among patients with acromegaly, using a 1–5 Likert-type scale. A Spearman's correlation for the scoring obtained for the evaluated items was calculated for clarity, frequency and importance. Analysis of internal consistency was evaluated with Cronbach's Alpha. Analysis of the results allowed a further reduction where the items were listed according to clarity. Items were considered for final inclusion if clarity, frequency and importance were considered high, if clarity and importance were high together with low frequency, and also if frequency and importance were high and clarity low; in this latter situation the item was included but modified to enhance clarity. A further qualitative review of the pre-selected items based on prior experience with other similar instruments concluded in the initial 38-item questionnaire. In order to refine the instrument a further quantitative reduction was performed with Rasch analysis (dichotomous logistic response model) , using the answers to the questionnaire of a group of 72 patients with acromegaly from eight different centres throughout Spain. The Rasch model constructs a line of measurement with the items placed hierarchically and provides fit statistics to indicate just how well different items describe the group of subjects responding to a questionnaire . A final 22-item questionnaire was obtained (Table 1). The measurement properties (validity and reliability) of the resulting final questionnaire were tested and compared using standard procedures (Cronbach's Alpha and item-total correlation) (Fig. 1). The AcroQoL was originally developed and validated for Spanish-speaking population. The Spanish original questionnaire was first translated into English following recommended standard methodology . The Spanish questionnaire was translated by two professional, bilingual translators with a great deal of experience in translating HRQOL questionnaires; both translations were compared with each other and with the original Spanish version at a consensus meeting; if the translation was clear and correct no changes were made; if there were doubts or contrasting opinions with the project manager, a consensus was reached after in-depth discussion, to produce the first English version of the questionnaire. This version was then independently translated back into Spanish to ascertain equivalent significance in both languages. After a second meeting, the second consensus English version was produced, and presented to five English-speaking Australian patients with acromegaly to asses and correct for comprehension, clarity, cultural relevance and suitable wording (cognitive debriefing), thus providing the final English version of the AcroQoL questionnaire. Afterwards the AcroQoL questionnaire has been translated into many other languages such as: Dutch, French, German, Greek, Hungarian, Italian, Portuguese, Portuguese for Brazil, Swedish and Turkish following the same procedure stated above. Why is the AcroQoL a good instrument to consider using? AcroQoL is a disease specific questionnaire for acromegaly with good psychometric properties which were measured initially in a descriptive study with a sample of 72 patients throughout Spain. The item-total correlation and the reliability and internal consistency evaluated by Cronbach's Alpha analysis of the different subscales of the 22 item questionnaire are expressed in Table 2. Both the complete 22 item questionnaire and the two different scales of eight and 14 item have a Cronbach's Alpha value > 0.8, which indicates high reliability and internal consistency. A six month follow-up study was carried out in order to measure responsiveness to change. A sample of 95 patients with acromegaly was obtained, 36 (37.9%) of them were included in the group of responsiveness to change, and 59 (62.1%) in the reliability group. Responsiveness to change after medical or surgical treatment was measured in those patients with active acromegaly, and compared with the results of the EuroQoL 5-D questionnaire. The results showed a statistically significant relationship between all the dimensions of AcroQoL and the VAS of the EQ-5D. Therefore an improvement in the global score of AcroQoL is related to a global improvement in HRQoL (Table 3). The feasibility of the questionnaire showed to be over 95%. What are the applications of the AcroQoL? AcroQoL is a simple and valid specific instrument to assess HRQOL in people suffering acromegaly aged 18 to 70 years. It can be used in two different fields: in clinical trials of new drugs, and in the monitoring of patients in clinical practice. This is to assess patients' self-perceived status as well as to be used as an instrument to screen patients who require appropriate further evaluation due to its good responsiveness to change. The longitudinal assessment of HRQOL of patients suffering acromegaly will increase the knowledge of the impact of the disease on patient perception of well-being and functioning. This is particularly useful in the evaluation of intervention or treatment effects. AcroQoL, as a disease-specific questionnaire, evaluates those dimensions that have been described to specifically affect to patients with acromegaly, therefore it detects morbidity that could be missed by generic tools. Nevertheless when the aim is to evaluate new interventions it's desirable to use AcroQoL together with a generic questionnaire, such us PGWBS , in order to cover new dimensions of quality of life that haven't been described as important in the acromegalic patients. The questionnaire is uni-dimensional and contains 22 items divided in two scales: one that evaluates physical aspects (eight items) and another one that evaluates psychological aspects (14 items). This last one is also divided in two sub-scales: one of them that evaluates physical appearance, and another one that evaluates the impact of the disease on the personal relationships of the patient (seven items each). AcroQoL is a self administered questionnaire. Only in those cases where the patient has some difficulties in reading, the questionnaire can be read by the investigator and answered as an interview. How long does it take to complete the AcroQoL questionnaire? It takes about five minutes to answer the questionnaire. How is the AcroQoL scored? where X is the sum of the answers (between 1 and 5 for each answer) (from a minium of 22 – worse QoL – until 110 – best QoL –). Is the AcroQoL responsive to change? As it has been explained before AcroQoL has demonstrated to be responsive to change. In a sample of 36 patients an improvement in the global score of AcroQoL showed to be related to a global improvement in HRQoL measured by EVA-scale in EQ-5D (Table 3). In which populations has AcroQoL been used? The acromegaly-specific questionnaire has been used in patients aged 18 to 70 years who have been diagnosed of acromegaly thoroughout Spain. Even though it has been translated to many other languages, we are not aware, at the moment, of any other original publications using the AcroQoL questionnaire. Who may I contact to obtain a copy of AcroQoL? If you need any additional support about how to work with the AcroQoL questionnaire please contact the same addresses as above. AcroQoL is a self-administered disease specific questionnaire to measure quality of life in patients with acromegaly. It contains 22 items divided in two scales that measure physical and psychological aspects. The validation process demonstrated the questionnaire to have high internal consistency, reliability and responsiveness to change, therefore is a useful tool to be used in clinical trials as well as in the monitoring of patients in the clinical practice. It has been translated into eleven other languages. XB: took part in all the steps for the design and development of the questionnaire, as well in the validation process. Collaborated in the writing of the review paper. SW: participated in the development of the questionnaire as well as in the validation process of it. Collaborated in the writing of the review paper. NL: collaborated in the validation process of the questionnaire and wrote the review paper. LP: participated in the development of the questionnaire as well as in the validation process.